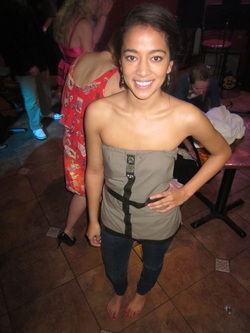 Purdue Fashion Show at Hookah! 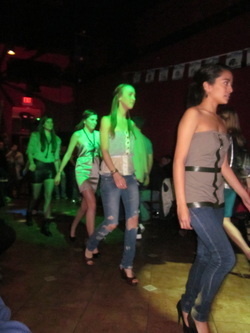 Purdue Fashion Association (PFA) recently put on a fashion show at the Hookah bar on campus. The show consisted of various pieces that were made by designers of all ages, freshman through senior. I decided to put three pieces into the show. Carly Derheimer wore one of my evening wear dresses with the 16 inch exposed zipper straps and the mid section cut outs. 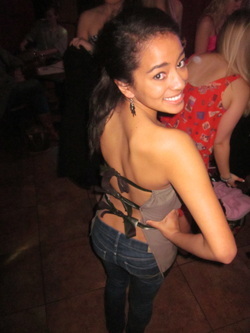 Ann Yaacoub modeled the open back top with the snake skin leather ties. I modeled a strapless top from my spring collection with a soft floral print and a mesh midsection.